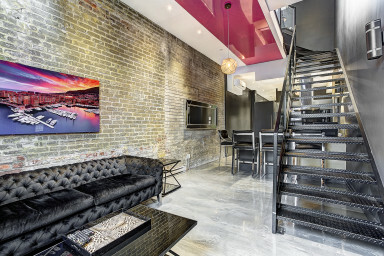 Milton Parc Hotel is definitely the reference type Loft Design Hotel in the heart of Montreal. It is perfectly located at the corner of rue Parc and Milton, less than 3 minutes away from the Place des Arts and Mont Royal Park. Quartier Milton Parc is a bold project that consists of 8 lofts, including 3 penthouses with private terrace and private parking. The Milton Parc was designed and thought with exclusive expertise in order to redefine the comfort standards and the pre established standards of the industry. 5 urban lofts consist of an area of ​​about 800 square feet with panoramic windows, metallic powder flooring type, electric fireplace and a stretched canvas on the ceiling! The perfect union between the authentic character of a loft and a vanguard modern construction. The semi-closed bedroom has a king bed with top quality mattress and a fully walk-in closet. Each Loft includes unlimited high-speed internet connection, a telephone line and two flat screen TVs including Smart TV technology in order to navigate without limit on the Internet or even on your Netflix account. The Milton Parc Hotel has chosen to equip all its units with the best equipment for the comfort of all our guests. . All the units also have a Nespresso coffee machine. Très bon emplacement et appartement esprit loft vraiment très sympa ! Just steps from the Metro and in close proximity to everything, the location could not have been better. The space itself was spacious and modern. It was the perfect setting for a special get-away. Wonderful location for restaurants, sightseeing, local culture, and nightlife. I would stay here for every visit to Montreal. The apartment was BEAUTIFUL, and location superb. I loved the keyless entry, and the nearby restaurants, next-door convenience store with ATM, and the quiet neighborhood. We walked everywhere from here. The decor was fantastic, and all amenities great. The only reason I don't give an EXCELLENT rating is: 1) no privacy or soundproof room in the whole place--it looked interesting being open air, but with 4 people in it, very difficult to have one sleep and another watch tv, etc. Would think this is definitely not for two couples or for small children! 2) bedroom TVs were not connected to any kind of service and could not connect to our ipads, so useless, really. would have been great to be able to watch a movie from the bedroom! 3) the entrance hallway had a nice bench for you to sit and take off/put on shoes/boots, but it needed an absorbent big rug/mat on the floor to soak up the salty/snowy mess from our shoes. 5) It would be nice to include detergent for one laundry wash (it would cost so little and would allow guests to not have to buy a huge batch of detergent to do one or two washes!) 6) bathroom entry door was frosted glass, which meant, if someone got up and turned on the bathroom light in the middle of the night, the entire apartment was illuminated and all were woken!! 7) in winter-time, there should have been 4 spare blankets provided, just in case, and for the times you don't want high heat in the house, but you want to be cozy watching tv... We had a lovely stay and will recommend your place to others for sure. I liked everything, except the bed. The loft has a very nice style and atmosphere, but the open-concept sleeping arrangements are not ideal. I would not recommend staying here. Very disappointed in the ivetalbexperience. Would not recommend this accommodation nor would i ever stay here again.